Enjoy these blouse styles that will take you to work, school or out to cocktails. These easy-to-sew blouses are designed for fluid fabrics. To create your own custom look, each sleeve, collar or front opening can be easily placed into another view, making this pattern a true mix-and-match design. 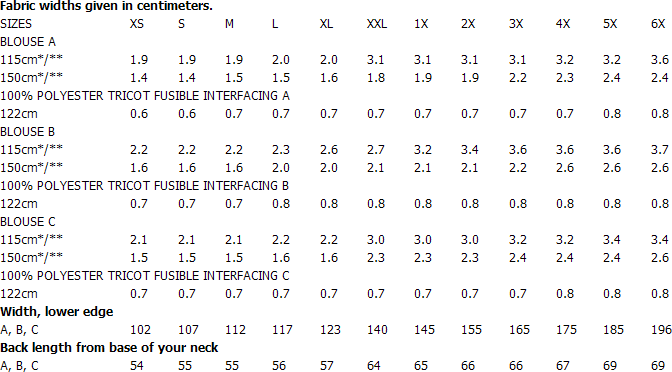 There are scores of options to design a blouse for your personal needs. Notions description...NOTIONS: Miss A, C: Five 5/8 inches Buttons, B: Eleven 5/8 inches Buttons. 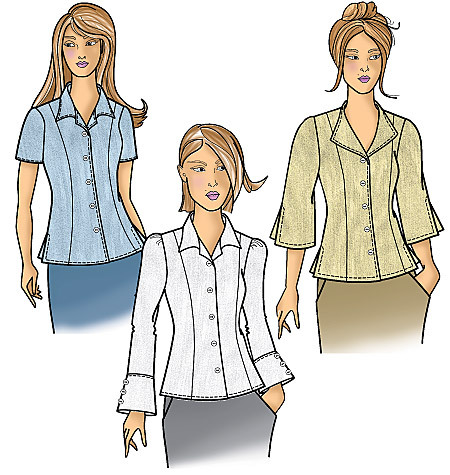 Woman A, C: Five 3/4 inches Buttons, B: Eleven 3/4 inches Buttons. Faille, Crepe, Lightweight Broadcloth and Charmeuse. Interfacing A, B, C: 100% Polyester Tricot Fusible Interfacing.